Since the Jan. 25 revolution, sectarian incidents in Egypt have increased dramatically. Many argue that the Copts have become vulnerable to sectarianism because of the Islamists’ rise to power — the Muslim Brotherhood and the Salafis — and that the Copts have been migrating in massive numbers to the US, Australia and Canada following the revolution. Muslims and Copts cooperated to topple the Mubarak regime, the Church opened its doors for Muslims on Fridays for prayer ablutions and they chanted for Egypt together. Why is sectarian sentiment in Egypt increasing? How did cooperation turn into conflict? First, rising sectarianism in Egypt is not new. Although Egyptians cooperated on the road to the Jan. 25 revolution, sectarianism in Egypt has historical roots and it has continuously manifested itself on many occasions throughout contemporary Egyptian history. The trouble with Egyptian sectarianism is that Egypt has not been able to create an inclusive social contract. The neo-millet system that defines the relations of communities in Egypt is based on religion rather than citizenship. Thus, Copts have been marginalized, except for a short liberal era during Prime Minister Sa’ad Zaghlul’s premiership and had significant difficulties in practicing their fundamental rights. Church construction, which has always been central to the sectarian conflict, was regulated with a parliamentary decree in the 1930s, making building additional churches almost impossible. To this day, church construction and renovation remains a controversial issue which has resulted in a good number of homes used as churches that only add to the sectarian fight in Upper Egypt. Nonetheless an entente between the ancient Coptic Orthodox Church’s leadership and the authoritarian Egyptian state started to emerge as early as the 1950s during President Gamal Abdel Nasser’s reign. The “friendship” developed by these leaders did not cure any problems but delayed and deepened Egypt’s problems. The late Pope Shenouda III of Alexandria’s rise to power in 1970s and his fight with President Anwar Sadat brought about a break in the good relations between leaders and resulted in a new understanding between President Hosni Mubarak and Pope Shenouda, who returned from exile after Sadat was assassinated. While Mubarak had absolute power in all affairs, Pope Shenouda took control of the Coptic community and mediated between the regime and the Coptic community. Attacks on Copts, problems related to religious freedom, rights and justice issues were solved between these two leaders rather than the enforcement of the rule of law. Not enforcing the rule of law served two objectives; denial of the existence of sectarianism and denial of justice. Furthermore, the Mubarak regime was smart enough to use the Copts and the Muslim Brotherhood against each other. On the one hand, since the Coptic diaspora was influential in the US, Australia and Canada and urged these liberal democracies to protest against Egypt, Mubarak was able to present the Islamists with an excuse by emphasizing his role as a Muslim leader. On the other hand, he made it clear to Copts that Islamists could easily attack them if he was not there to rule the country. Egyptian scholar Dina Shehata claimed that this tactic weakened opposition to the Mubarak regime and cooperation between these groups to topple Mubarak was delayed. This leads me to my second point. If there was such cooperation, why did sectarian conflict increase immediately? The Egyptian revolution kindled sectarian fears and the prevailing chaos provided a fertile environment for the transformation of passive sectarianism. The Muslim Brotherhood was able to form a dysfunctional government that did not necessarily provide enough room for Copts in the new constitution, and it actually failed to start a dialogue between the government and the Coptic Church. This added to the existing fears, given the fact that Pope Shenouda died in March 2012 and the community remained leaderless for at least seven months. Furthermore, the secular Egyptian opposition’s lack of a coherent strategy overlapped with President Mohammed Morsi’s mismanagement of the political crises that further pushed the country toward civil war. However, one also needs to analyze the developments within the Coptic community and the institutional fissures between the Church and the state to understand the causes of the current violence. Beginning in 2005, the Coptic community started to mobilize against the Mubarak regime and created ethno-political movements resisting “the state of denial and injustice.” Mubarak’s initiative to amend the personal status law caused fissures in the institutional entente and encouraged the Church to speak against the state. Resistance of the Church and the Coptic youth groups was also a response to state-sponsored and symbolic incidents of violence. The Egyptian Initiative for Human Rights reported that 40 sectarian incidents were recorded between 2008 and 2010 and implied that security forces played a role in such incidents. After the Maspero cleansing in which 24 Copts were killed by the security forces during a peaceful protest, it is now clear that the state has long sponsored violence against the Copts. However, this does not account for the Salafis’ or Muslim Brotherhood’s supporters’ attacks on the Copts, especially in Upper Egypt, where the state exercises power lightly. Nevertheless, the attack on the St. Mark Cathedral in Cairo last month, the headquarters of the Coptic Orthodox Church, reveals that Islamist mobs and security forces cooperated. Video clips show that the Egyptian police not only remained indifferent to the ongoing attack but also helped attackers hold their guns. Despite the lack of information on whether these mobs were affiliated with the Muslim Brotherhood or not, the Morsi government got (and will continue to get) the blame, as it failed to provide security and investigate the case properly. The new pope, Tawadros II of Alexandria, has changed the course of the Church in negotiating with the state as well. He recently issued demands for security and justice and argued that the Copts will not tolerate violence, nor will they allow others to deny the existence of sectarianism any more. This makes one wonder if there is room for dialogue and negotiation that could decrease the violence and bring about lasting solutions. Egypt is experiencing a moment in which passive sectarianism is transforming into assertive sectarianism. This aggressive approach might bring the country to the brink of a civil war, given the current economic and political chaos. 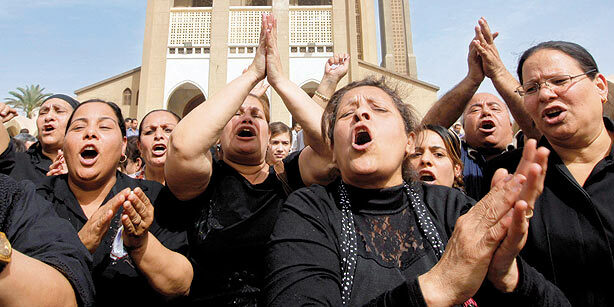 Nevertheless, there is a common ground for both the Copts and the Muslims of Egypt. If President Morsi and Pope Tawadros could establish a dialogue to work together to fix the problems of citizenship and religious freedom, this daunting threat could be avoided. Indeed, leadership dictates cooperation for a common and prosperous Egyptian future. P.S. This piece was first published by Today’s Zaman.